I got the name for it, but do I actually live by it? That's the question I get asked is why do I chose the name "Right Way to Eat"? More importantly, what is the right way to eat. Now granted, I never proclaimed to be a health guru or some fitness buff, but I always thought I know what taste good and can point out where you can get the delicious bites. Funny enough, it doesn't always translate to that healthy consciousness to the minds of my greenie friends. The opportunity to visit a popular, well known vegan restaurant on the westside was killing two birds with one stone for my taste. One, it etch a vegan category for the books. Two, it may (or may not) quell the uproar about my blog's name. Yup.... good luck to me on this one. The restaurant was named after a renown award winning chef Nick Erven. Held in high regards among dining groupie as the it guy with a flair of the dramatics in the food scene. A former punk band guy who worked up the restaurant chain in his early years, enroll in the then Pasadena Le Cordon Bleu, and racked up acclaims for his former restaurant St Martha. In short, you will be astound and in awe of the stops he made along the way before opening up his restaurants. 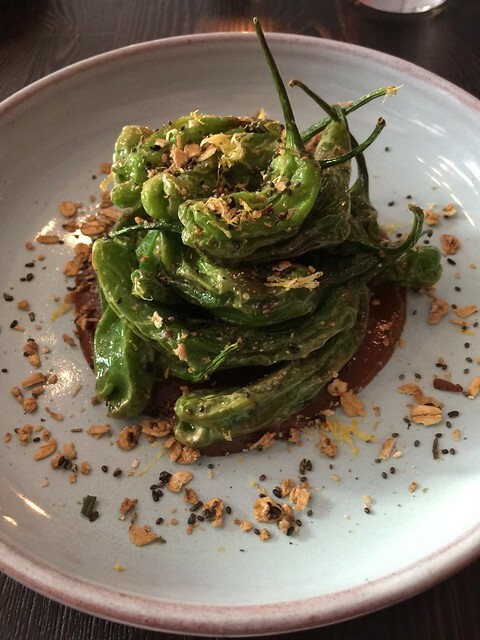 Erven, the restaurant was spearheading the forefront on the plant based food that can be accessible for the dining scene. You will have to visualize in that going meatless is a tough torture for this town as the most green you'll see are on the appetizers to cleanse your palate before the inevitable or some side salad that partnered with a soup. It's a tough sell for a market that is not big on pure greens or plant based food. For the obvious, a lot of the vegan or vegetable eccentric places eventually cave into meat dishes to recaptured some of the crowd they would excluded. You can surely guess, this place was no exception in eventually offering one meat dish as well. 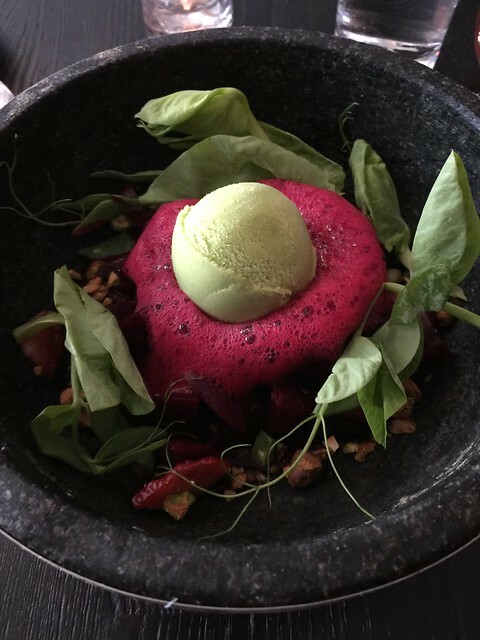 The most challenging dish on his repertoire is presenting his beets with array of pistachio, strawberry, rose vinegar, and pea. Except.... the pea is in the ice cream form. Splendid. Here's the deal though, it does taste like pea. This will sit with you for awhile. Luckily the shishito peppers that came out before hand was exactly what you are getting. It didn't take the ice cream off, but that and beet can worked together. Erven, the chef known for his playful plating on dishes with great uses of ingredients tends to capture the eyes of the diners to lure them in for that insatiable bite. One of his more creative dish was his interpretation of the Vietnamese classic pho. Sweet potato on a non-linear noodle bowl? Well folks, take my word on this, a lot of imagination and quite frankly one of the more inspired dish I have seen in trying to get you over to the darkside...cough... the healthy green side. The easiest way to do vegan would be desserts. My favorite of the bunch was his Yuzu and Strawberry Pavola. Nicely done with the basil sorbet. It is probably less complex than the pea ice cream I had earlier, but much more appealing to me without keep thinking of the veggie. To the uninitiated (myself included), going vegan is hard. Lifestyle wise, this can be life changing. This restaurant can help eased people into it. I personally have done it for a few months (more like weeks), where I met challenges on what to eat and how to cook it. This restaurant faced the same task where people are less likely to be immerse into a culture of total plant based food. However, I can honestly see them catered to that avid crowd and come out with sterling approval as I have seen them successfully praised by the restaurant/dining groupies here in LA. I hope they do well. Postscript 1/12/2018: As I wrote this earlier and just published it not long ago, heard the word the restaurant had already closed for good since the end of holiday. Bummer in that more people cannot get to try this veggie centered restaurant. Another sad chapter of how fast restaurants do close when words are not traveling fast enough.